Omeko was frustrated. She had spent the morning watching the humans ski on the mountain from a ridge in the woods. She had always wanted to ski. Ever since she was a little mooseling, but everyone said she was crazy. Moose don't ski! She did not see why. Why couldn't she ski? She watched those clumsy humans do it all the time. Why they could not even walk in the woods without bumping into things and falling down a bunch of times. And when they walked they sounded like an earthquake. So how come they could ski and she could not? Once one of the humans skied into the woods and crashed into a tree right in front of Omeko. The human was not hurt, but he did not even see Omeko standing a few yards away. Omeko got a real good look at the skis the human wore because they came off when the person hit the tree. For a moment Omeko thought the human would leave his skis behind and she could try them, but the human found them and carried them off. Omeko could hardly hold in the laughter as she watched the human crashing through the woods, bumping into bushes and trees (he fell down three times!). But Omeko's friends did not approve of her hobby. They kept telling Omeko that humans were dangerous and that she should stay away from them. And whenever Omeko started talking about skiing, they would look at her like she was crazy and just shake their heads. But Omeko didn't care. She knew that someday she would show them all and ski down the mountain too. One day Omeko was walking in the woods near the ski trails when she was almost run over by two small humans that were skiing on a really narrow trail. It was so narrow that Omeko had not even noticed it. In fact, she was standing right over the trail with her tail in the woods on one side and her head in the woods on the other side when the two humans came along. First, one human skied right under her! Omeko was so surprised she just stood there staring back at the small human who was looking back over his shoulder with a really funny expression on his face. It looked like the human was about to shout something when all of a sudden the trail curved and, since the human was busy looking back at Omeko and did not see the turn, he went flying into the bushes with a big crash. Before Omeko could react, along came a second small human. Omeko turned her head just in time to see a girl human with a really crazy look on her face. Her eyes were open wide and her mouth was open into a big scream as she went zipping right under Omeko too! Poor Omeko just stood there staring (with what any other moose would describe as the most ridiculous look a moose ever had on its face too), while the small girl human went crashing into the same bushes as the other small human. Omeko just stood there gawking with her tongue hanging out for a few minutes. It had gotten really quiet and still. The humans were not making any sound at all. Omeko was suddenly worried, because humans were always noisy. She wondered if they had crashed into a tree and were dead! Oh no! It was all her fault! She cautiously crept over to the bushes where the small humans had disappeared. Still no sounds. So she leaned over and stuck her head through the bushes to get a peak. It was horrible! Her heart stopped! She was starring right in the faces of the two small humans that were also just trying to poke their heads through the bushes. Everyone screamed and jumped up! Ahhhhhhhhhhhhhhhhhhhhhhhhhhhhhhhhhhhhhhhhh! Omeko was so scared she forgot to run away. She just stood there looking in horror at the bushes. Then after what seemed like a hour (it was only about 30 seconds), the two small humans crept out of the bushes. They were clutching each other so closely, that Omeko thought it was one human with four legs and two heads. A monster was after her! She remembered what all her friends has said about humans. Oh why didn't she listen? Now the monster was going to get her. She shut her eyes tight and lowered her head down to her feet and waited. She kept waiting. She waited some more. Nothing happened. Now what should she do? Maybe the monster had left? She wanted to look, but was afraid to open her eyes. So she waited some more. After a while, when her heart had calmed down a bit, she began to feel a little silly standing there in the middle of the woods with her eyes closed and waiting to be eaten by a two headed human monster with four feet. So she slowly opened one eye and then the other. Oops the monster was still there. But it was just standing there like it was frozen and its four eyes were all shut tight too. After a while it opened two of its eyes (one on each head). Then it opened all four eyes. Then as Omeko watched, the monster split into two small humans. Though not completely as they still were attached by the arms. Omeko blinked. Then the small girl human said "Ah, hello Mr. Moose. Nice Moose. You wouldn't hurt us would you Mr. Moose? "� Well normally Omeko would not have understood what the humans were saying. It would just have sounded like "yak, yak yak.yak. Yak yak. Yak yaky'k yak yak yak yak yak.yak? "� But something really strange was happening because she understood them perfectly well. They were speaking moose fluently. Omeko stuttered "Why would I want to hurt you? Please don't shoot and eat me. "� The humans looked at each other in wonder because instead of hearing moose talk ("Snort snort snort snort snort snort? Snort snort'rt snort snort snort snort. "�), they heard her speak in excellent English. There was a pause and then the moose and humans all said at the same time, "how can you talk? 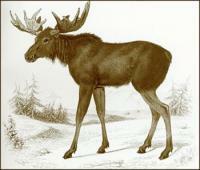 "� The humans meaning in English, and Omeko meaning in moose. They just looked at each other again. Then Omeko said, as she looked slowly around. "Hey, I know this place. Its the magic place where the Indian wise men used to talk to the animals. "� The two humans looked around too. "Wow"� said the one that had skied under Omeko first, "My name is Sam, and this is my friend Sally. "� "Pleased to meet you. My name is Omeko"� the big moose said. "But are you alright? I'm sorry I was standing across your trail. It was so narrow I did not notice it"� she apologized. "We're O.K." said the small human named Sally. "We were just surprised. "� "Yeah, I tried to warn you Sally"� said the small human named Sam. "But then I crashed into the bushes. "� "Yeah, you looked so silly! "� said Sally. "Me? "� said Sam. "You should have seen the look on YOUR face. "� "You both looked ridiculous"� Omeko said brightly. "Us! "� exclaimed the two humans. "You had to be the silliest looking one of all. Your tongue was hanging out and your eyes were crossed. "� said Sally. "Yeah, we thought you had rabies or something"� said Sam. Well, Omeko was kind of upset by that remark, but she did not say anything. The three of them stood there looking at each other for a moment, then they all burst out laughing. It was all Omeko could do to keep from rolling on the ground. The humans did fall down and roll on the ground of course. Omeko did not think humans could stand up very long since they seemed to always be falling down. The two humans and Omeko talked together for a while, then the two humans said they had to go before their mothers sent out a search party for them. But they all agreed to meet together at that same spot after lunch. Omeko could hardly wait to see the humans again. She had not said anything yet, but she was dying to ask the humans all about skiing. Right after lunch, Omeko met the humans just as they had planned. They all started talking at once. You see in all the excitement earlier, they did not know what to talk about. Now they all had lots of questions. The humans wanted to know all about being a moose and Indian magic, while Omeko wanted to know all about humans and what it was like to ski. They talked for a long time, but then Omeko grew silent and seemed a little sad. "What's wrong"� asked Sally. Omeko could not stand it any longer. She quickly told them the whole story about how she had always wanted to ski, and how the other moose always made fun of her and said she couldn't. Sally and Sam were sympathetic. "Maybe we can help"� offered Sam. He brought over his skis and placed them next to Omeko's hind feet. "Try standing on these. "� Omeko, hesitantly stepped on the skis with her hind feet. "Like this? "� "No"� laughed Sam and Sally together. "You have to put your feet into the bindings and stand up. "� Omeko gingerly placed her hooved feet into the bindings, and amazingly they fit. The ski bindings snapped onto her hard hooves just like they would a ski boot. Maybe it was some more of the Indian magic, but no one seemed to notice that it was unusual. Sam and Sally stood there watching Omeko. She just stood there, not knowing what to do. She sure looked silly with skis on her hind feet. "Well don't just stand there"� said Sam. "Stand up. "� Omeko looked bewildered. "Huh? I am standing up"� she said. "No! I mean up on your hind legs"� Sam chuckled. Omeko looked down at her feet. "But I can't do that. I'm a moose"� exclaimed Omeko. She just stood there looking at them with a hurt expression on her face. Sam and Sally looked back and forth at each other. The silence grew. No one knew what to do. Then Sally got an idea. "I know"� she said as she ran to get her own skis, "you can use my skies on your front feet! "� So Sam helped her put her skis on Omeko's front feet. Now, if you did not think Omeko looked funny with two skis on her hind feet, you'd have to admit that she looked absolutely absurd with skis on all four feet! Just close your eyes and image the scene with a big moose named Omeko standing in the woods next to two small humans while wearing two sets of skis! But Omeko just stood there with a huge smile on her face and starred at the skis on her feet (have you ever seen a moose smile?). After a while Sam said "Aren't you going to ski Omeko? "� "Huh? "� Omeko looked up. "What? "� "Ski"� said Sam. "Aren't you going to ski? "� "Oh"� Omeko looked around and then back down at her skis. "Um. Sure"� she said. But she just kept standing there looking around. Sam got a little impatient. "Well, do something? "� Omeko looked back and forth between Sam and Sally. She looked really confused. "I don't know what to do"� she said finally. Sally and Sam ran over to her and started trying to tell her how to ski. But Omeko just stood there starring with her tongue hanging out again. After awhile Sam had an idea and asked Sally to help. They started pushing Omeko. Slowly Omeko started to slide. Omeko was not so sure that was a good idea and she started to get nervous. "Sam! Sally! Not so fast. Maybe I should practice standing some more. "� But Sam and Sally kept pushing. Soon Omeko was sliding along towards a small hill. Her eyes got wider and wider as she looked down the little slope. The humans let go as Omeko went over the edge. "Ahh! "� She yelled as she began going faster and faster! "Help! How do I stop!!! "� wailed the frightened moose. "Ought oh"� gasped Omeko as her feet began slipping. Not many people were around to see what happened, but those that were there certainly never forgot it for the rest of their lives. There was a moose wearing four skis tearing down the mountain as fast as lightening. First she was on four feet, then three feet, then two feet! For a moment there was a moose skiing on one foot! Oh, and you could hear her screaming all through the valley. Sam and Sally heard "Ahhhhhhhhhhhhhhhhhhhhhhhhhhhhhhhhhhhhhhhhhhhhhhhhhhhhhhhhhhhhhhhhhhhhhhhhhhh hhhhhhhhhhhhhhhhhhhhhhhhhhhhhhhhhhhhhhhhhhhhhhhhhhhhhhhhhhhhhhhhhhhhhhhhh!" But the rest of us heard "Snorrrrrrrrrrrrrrrrrrrrrrrrrrrrrrrrrrrrrrrrrrrrrrrrrrrrrrrrrrrrrrrrrrrrrrrrrrrrrrrrrrrrrrrrrrrrrrrrrrrrrrrrrrrrrr rrrrrrrrrrrrrrrrrrrrrrrrrrrrrrrrrrrrrrrrrrrrrrrrrrrrrrrrrrrrrrrrrrrrrrrrrrrrrrrrrrrrrrrrrrrrrrrrrrrrrrrrrrrrt!" Did Omeko get killed? Of course not. Everyone knows that moose don't fall down. At the bottom of the run, Omeko slowed down and stopped. She kicked off the skis and walked slowly up to the two small humans who had watched the whole thing. For a moment they thought she was mad because she just stood there. Then she jumped ten feet into the air and whooped as loud as she could "Wow! That was awesome! Did you see me? I was great! Did you see how fast I was going? Was I flying? Wow! Cool! I can't wait to do that again. "� And they all laughed and whooped and jumped and congratulated each other. And from that day on, whenever Sally and Sam went skiing they would meet with Omeko and ski together all day. Omeko eventually got her own skis and got a job at the ski resort as their mascot. So if you ever see a moose with four skis coming down the mountain, don't call the doctor. Its just Omeko having some fun.